We’ve just released User Groups, a major enhancement to how our business customers can manage user accounts. When you add a group, each person in that group will be automatically added as well. When you add a new user to a group, that user gets access to everything to which the group has been given access. When you remove a user from a group, they lose access, unless they have otherwise been granted access. User groups are especially useful if you need to grant fine-grained access to a specific group of people, such as the members of a department within your organization, or a client team. Only a Network Administrator can create user groups, so if you need a new user group on your network, contact one of your Network Administrators. If you’re a Network Administrator, check out the Group Management page in the user manual for instructions on how to create, rename, delete, and manage your user groups. As your organization’s use of PBworks continues to grow, user groups can help you manage the increasing number of users. For more details on user groups, visit the User Groups page in our user manual. Who among us hasn’t dealt with CRM (Customer Relationship Management) software? Whenever you call up your credit card company, it’s the CRM system in the background that the overseas customer service rep is reading from. Whenever the phone company calls you with a new offer, the CRM system is logging the call. But curiously enough, while CRM software is supposed to *manage* the customer relationship, it doesn’t actually touch the customer. And after your calls with your credit card and phone company, do you feel satisfied? Or do you feel managed? This isn’t to say that CRM is unnecessary–just imagine if those customer service representatives didn’t know your account balance or customer history when you called! And CRM has become so important that CRM sales are measured in the billions ($14 billion in 2007). But it is true that CRM is necessary, but not sufficient. Especially for customers like advertising agencies, the customer relationship is a complex, high-value, long-term affair. It’s hard to capture it as a row in a database. Much of the relationship has been unwritten and personal. But with the continual change and personnel turnover that is now endemic in business, that’s no longer enough. The solution we’ve developed in conjunction with our customers is to use PBworks as a persistent environment for collaborating with their customers. Rather than relying on email and telephone, our customers can create a workspace for each client or client project, use it as the central hub for communications, content, and coordination, and build some long-term relationship infrastructure that doesn’t depend solely on the personal relationships of the people involved. The new Customer Relationship Edition (CRE) that we launched today includes additional features that enhance PBworks for this use case, including the ability to track your top prospects and customers, and receive instant alerts whenever they log in, including updates on what content they’ve read or downloaded. The CRE enhances CRM and makes it truly collaborative–something anyone who has sat on the phone with their credit card company will appreciate. For more information on the Customer Relationship Edition, visit our website. You can also sign up for a free Webinar introducing the CRE on Tuesday, August 10. To request a one-on-one demo of the product, fill out this form. This week we simplified the toolbar and made changes to they way you can add plugins, horizontal lines and tasks. Now instead of surfing through a confusing menu of plugin options (hey, what’s a plugin! ), you can now quickly chose from the most highly used options. Additionally, for Business Edition users, we’ve now made it super easy for you to insert tasks on your workspace pages. 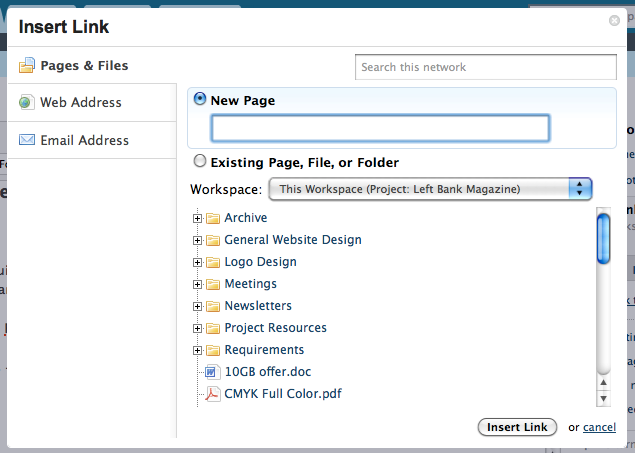 We’re also introducing a new way to add links on your workspace pages. 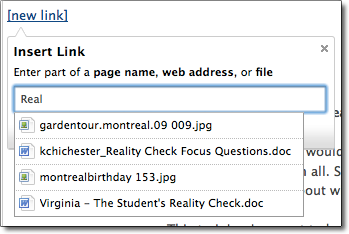 You no longer have to chose what your linking to (URL, wiki page, file), instead just begin to type and PBworks will offer a list of existing pages and files on your workspace. For Business Edition users, you can now easily link between multiple workspaces. Tell us what you think of these changes, leave a comment!